One item I was pleased to score during the Nordstrom Anniversary Sale is a cool new black leather jacket. The one I already own is a moto style from Topshop several years back, but this time around I wanted something a little more effortless and relaxed. In addition to the more feminine silhouette, I love the supple leather and slouchy fit of this jacket you see here. So many leather jackets I’ve come across are super stiff or too thick, which does not work for the warm-year-round climate I’m used to! Luckily this jacket doesn’t stifle or restrict me, and easily layers over lightweight sweaters and my favorite tees. Since this jacket is real leather, it’s still a bit of a splurge at $199 – with that said, the price will go back up to $299 at the end of the sale (August 6th)! 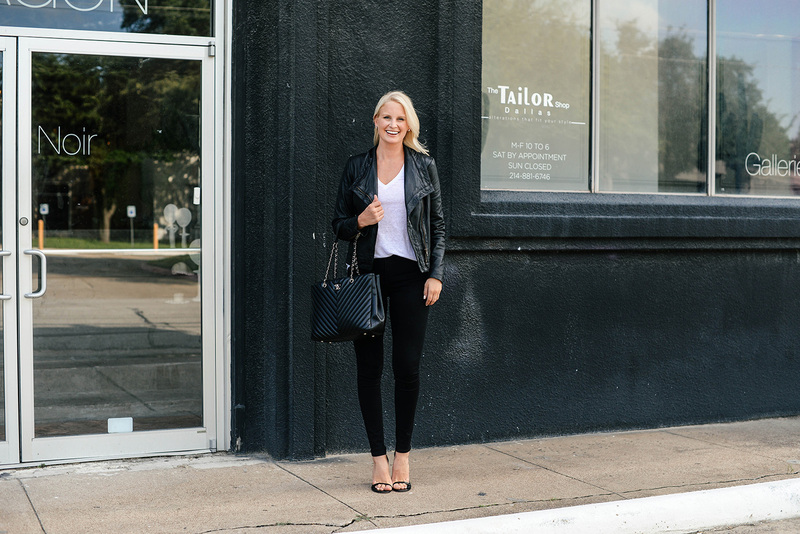 Plus, it always pays to have a luxe wardrobe staple like a black leather jacket. I take them with me whenever I travel, because it truly is such a versatile topper. If your size is currently sold out, keep an eye on it – I saw this come back in stock early this morning only to sell out again in just twenty minutes!! A few other leather jackets I’m loving from the sale include this soft grey leather style (so pretty! ), this jacket with gold hardware (this one too! ), and this textured moto. I also wanted to touch on this pair of skinny jeans that are part of the sale too. Monday I mentioned the Hudson Barbara skinny jean, which is one of my favorites that I now own in two colors… and today I want to tell you about this J BRAND pair. I’ve owned the “Maria” for years. I have these jeans in white, dark blue and light blue, and at one point had them in black before misplacing or mistakenly donating them when cleaning out my closet this year. A reader brought to my attention that the Maria was part of the Anniversary Sale, which inspired me to go look in my closet to find my black pair, only to realize I no longer had them! Thank goodness for sales, am I right? I got on Nordstrom right away and ordered a fresh pair in black. The high-waist style, super skinny ankle and thicker denim fabric make the Maria the ultimate little black jean. Right now you can grab a pair for $130, down from $198! They are also on sale in this edgy grey hue for fall. PS – both of these items fit true to size. I’m wearing a small in the jacket and a 27 in the jeans! This outfit is amazing!! It has that cool factor but still really chic! Love this chic look! Perfect for a night out! You always look so chic and gorgeous! I think I might need these jeans!